More and more people are discovering South Oceanside's culinary secret... The Privateer Coal Fire Pizza. Here's a recent sampling of magazines, newspapers, Internet sites, and blogs that have said a lot of complimentary things about us! 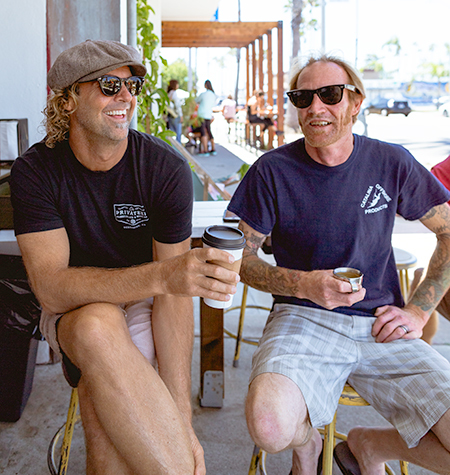 Oceanside's dining (and drinking) scene has been dramatically transformed since 2008. The Privateer Marketplace was a leader of that transformation. Thanks for the mad props Pam Kragen! The North County city has gone from an all-but annexed coastal town by Camp Pendelton to a thriving bed of culinary and artistic success. Read San Diego Mag's article by no other than Troy Johnson (a regular on Food Network). Props to you Troy! Check out what our friend Mary wrote about our fabulous pizza pies as well as our scrumptious Faye's desserts across the hall at the Privateer Marketplace. Thanks for the mad props Mary! Privateer Coal Fire Pizza has been featured in "25 Best Things to Do in Oceanside"
We were recently featured on an episode of TravelSecretsTV.com for having the largest coal fire oven in Southern Cal. Check out the kind words our friends at VisitOceanside.org had to say about us and our tasty apps and popular combo deals. Jolee Pink, blogger from wabisabigreen.com, was kind enough to give us a shout out for the freshest of fresh organic ingredients used in all of our appetizers, entrees, and pies. The O'sider Magazine featured the local band The Drowning Men as the hangout at the favorite place.. the one and only, The Privateer. Live in the Sky Lounge of the Wyndham Oceanside Pier Resort, the Drowning Men share a few songs and guide G&G to can't miss grub at The Privateer. Coal-fired-pizza done great! "Give into the sauce"... follow your nose and taste buds to S. Oceanside... straight to The Privateer! Lunch was featured at The Privateer Coal Fire Pizza.